Death takes the form of a young man and asks a media mogul to act as a guide to teach him about life on Earth. In the process, he falls in love with his guide's daughter. Back when Meet Joe Black hit screens in November 1998, I did not intend to see it. Although I like its stars, the movie received rather weak reviews, and the subject matter didn’t really interest me. Add to that the fact the film clocked in at a whopping three hours and it seemed likely Universal wouldn’t sell me a ticket. However, circumstances conspired to get me into a showing. Sometimes you’re just in the mood to go to a movie, and that’s when you’ll take in almost anything you can find. Meet was near the end of its disappointing theatrical run - the flick took in only $44 million US, which was a poor total for a $90 million star-vehicle such as this - and I’d already seen everything else of interest. As such, my then-girlfriend and I settled in for a screening of this apparent clunker. To my surprise, I actually enjoyed Meet. While the film didn’t seem to be a classic, it offered enough charm and appropriate drama to earn my respect. I couldn’t understand why the movie endured such a critical lambasting, as it really was a fairly entertaining experience. Now that I’ve watched Meet again, I still think it’s a decent film, but I better understand the flick’s problems. Ultimately, the movie works because of a strong cast and an interesting concept, but some aspects of it ensure that the experience becomes less than engrossing. Based on 1934’s Death Takes A Holiday, Meet Joe Black focuses on enormously successful media mogul William Parrish (Anthony Hopkins). As he approaches his 65th birthday, he begins to hear a strange disembodied voice say “yes” to him, and it subsequently expands into other statements. 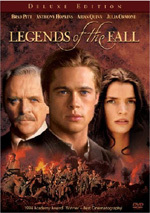 Simultaneously, his daughter Allison (Marcia Gay Harden) plans an extravagant party for him, while his other daughter Susan (Claire Forlani) deals with matters of the heart. She’s involved with Drew (Jake Weber), one of her dad’s advisors, but she clearly feels no spark or passion. Bill encourages her to seek a brighter, wilder love, just like the one he shared with her mother. As the day progresses, Susan indeed seems to find someone who may cause those feelings when she encounters a hunky dude (Brad Pitt) in a coffee shop. Clearly intrigued with each other, the two head their separate ways after coffee, and Susan doesn’t see what happens to her potential beau as he gets killed by a couple of cars. However, this man soon reappears on the scene; as it happens, Death simply took his body so he could spend a few days on Earth. Apparently Death is curious to understand the human experience. Death tells Bill his days are numbered, but he can have a little extra time if he acts as Death’s tour guide. Hesitantly, Bill agrees to do so, and his reluctance becomes even greater when a romance grows between Death - referred to as “Joe Black”, his real identity hidden to all but Bill - and Susan. Bill’s last few days are further complicated by business concerns; his board wants him to sell to a larger media conglomerate, but he refuses to destroy the business he created. If you read this synopsis and think that the plot seems awfully thin to sustain a three-hour movie, you’re right. Meet Joe Black doesn’t have enough action to make the entire flick interesting, and some parts of it seem to be tacked on and forced. The entire subplot about the business sale appears to be totally unnecessary. After all, this is supposed to be a film that shows Death’s experiences among humanity, so there’s no reason to spend all that time on such a useless tangent. Many portions of the movie run on much longer than they need to go, so entire chunks of the film feel padded. For example, Bill’s speech to Susan about romance and passion goes easily twice as long as it needs, and the initial meeting between Death and Bill also rambles along seemingly without end. The film comes filled with these kinds of moments, and more concise editing would make the flick much more stimulating and effective. And yet, I still think that Meet Joe Black brings a reasonably compelling experience. Largely, this occurs due to the cast. Hopkins offers a wonderful humanity to Bill, as he makes the curiously-underwritten role seem more alive and rich than should occur. The film reveals relatively little about Bill’s life and times, which seems like a strange choice since the story often concerns itself with his personal reflections. However, Hopkins fills in the blanks with his performance; although he never delivers much information, his attitude and demeanor help make the role become realistic and believable. At times, Pitt seems a bit forced and precious as Joe. This is largely a “fish out of water” part, as we have to watch Death experience all sort of new sensations. Oddly, the film often downplays these instances, but they still occur fairly frequently, at least during the early parts of the tale. Pitt appears somewhat cutesy during some of these early scenes, but he soon achieves a nice sense of character. Pitt makes Joe appropriately wide-eyed but also maintains a good sense of somber menace that would come with such a personality as Death. Harden gets the film’s most thankless part as underloved daughter Allison, and it’s also the role that contains the most opportunities to become cartoonish and annoying. During much of the film, we see Allison as a superficial party planner, and these characteristics don’t exactly lend heft to the role. However, Harden adds depth and personality to the part and she ensures that Allison becomes surprisingly endearing and sympathetic. Jeffrey Tambor also achieves a nice level of sincerity in the potentially buffoonish role of Allison’s semi-loser husband Quince, while Weber seems to be appropriately scummy as Drew. Actually, although his vague nastiness means that he appears appropriate for the corporate world, it ensures that his original pairing with Susan makes no sense. Granted, the film needs a bad match for her so she can meet her love connection, but I still find it hard to swallow that those two would ever interact positively. On second thought, maybe their pairing isn’t so improbable since Susan seems so lifeless. Forlani is stunningly gorgeous, but I have yet to see evidence that she can act, and her work in Meet offers its only weak link from this side. Forlani seems stiff and inert as Susan, and she imbues the character with little spark or reason to make us care for her. Ironically, Harden gets the less interesting role, but at the end of the day, Allison seems much more compelling than Susan. Admittedly, Susan is supposed to be at a crossroad in her life, so Forlani’s somewhat confused and nervous presentation occasionally makes sense, but frankly, I don’t think these attitudes are intentional. I think the actor just doesn’t know how to handle the part. Meet Joe Black is a hard film to firmly recommend. On paper, its flaws definitely exceed its positives. As you can tell from the preceding paragraphs, it’s much easier for me to enumerate its problems, as they’re fairly concrete, while the movie’s charms can be more ethereal. I guess that was why I ultimately like Meet Joe Black. For all its concerns, it still provides an oddly moving and involving look at life. 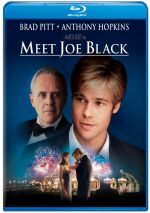 Meet Joe Black appears in an aspect ratio of approximately 1.85:1 on this Blu-Ray Disc. This wasn’t a poor image but it came with concerns. Edge haloes created the most obvious issues, as a fair amount of the movie suffered from obvious haloes. Those affected sharpness; while the movie often exhibited good delineation, the haloes rendered some shots – usually wide ones – as a bit mushy and soft. I noticed no concerns with jagged edges or shimmering, and grain remained pretty natural. A few minor print flaws popped up in the form of specks, but most of the movie stayed clean. Meet used a warm, natural palette for the most part. That meant I didn’t see many bright hues, but the colors remained solid and accurate nonetheless. Much of the movie featured a golden glow, and the disc replicated this nicely. Colors displayed no concerns, as they always appeared rich and distinct. Black levels seemed quite dark and deep as well, and shadow detail usually came across as appropriately opaque but not excessively thick. One early shot in Parrish’s bedroom looked a little dim, but otherwise these scenes were nicely rendered. The edge haloes remained the biggest issue here, and they left this as a “C+” presentation. The DTS-HD MA 5.1 soundfield for Meet was a modest affair. Other than music, much of the mix seemed to rarely venture outside of the center speaker. The vast majority of the speech stayed in the middle, and many of the effects remained close to home as well. During a few scenes, those latter elements broadened out fairly well. For example, helicopter shots opened up the mix, and the segments that related to the birthday party also provided moderate spread across the forward channels. A little panning occurred on city streets demonstrated decent panning as cars drove past. For the effects, surround reinforcement was minor. The track stayed heavily biased toward the forward spectrum, and any usage of the rears seemed to be mild. Even during a fireworks display - a good occasion to open up the track - the audio stuck to the front for the most part. While I didn’t expect an effects extravaganza, Meet seemed almost claustrophobic in the manner in which it snugly held onto those elements. Happily, the score often opened up the piece to a small degree. Thomas Newman’s music showed fine stereo separation across the front channels, and the surrounds added a nice level of breadth and reinforcement to his work. At times the rears really did embrace the score and make it swell up all around me. Audio quality seemed to be solid. Some louder speech came across as slightly shrill, but most dialogue sounded nicely warm and natural, and the lines showed no other signs of edginess. I also detected no problems related to intelligibility. Since they were such a small aspect of the mix, it could be hard to judge the quality of the effects, but they displayed no concerns, and louder elements such as helicopters and fireworks packed a modest punch. They didn’t light a fire under the film, but they seemed to be clear and accurate. Again, the score provided the finest aspects of the soundtrack. The music appeared nicely rich and lush throughout the film. Strings sounded smooth and lovely, and the entire track provided fairly positive dynamic range. Ultimately, Meet Joe Black provided a subdued auditory affair, but the result fit the movie and seemed to be satisfying enough. How did the Blu-ray compare to the Ultimate Edition DVD from 2001? Audio was similar; the lossless Blu-ray seemed a bit warmer, but the limited nature of the mix meant the two remained a lot alike. As for visuals, the Blu-ray came with problems but still improved on the DVD. I thought the latter looked good for its era and format, but the Blu-ray was more satisfying. Though it could/should look better, it nonetheless created an upgrade over the DVD. Some of the DVD’s extras repeat here. Spotlight On Location gives us a 10-minute and 17-second featurette about Meet Joe Black with comments from director Martin Brest and actors Brad Pitt, Anthony Hopkins, Claire Forlani, Marcia Gay Harden and Jeffrey Tambor. As always, the emphasis remains on the promotional side; “SOL” programs exist to tout their movies, so don’t expect great depth or detail. Nonetheless, the show for Meet was somewhat more interesting than most, and it was good to learn a little more about the production and the actors’ methods. In addition to the film’s trailer, we find a Production Photographs Montage. This six-minute and 19-second program shows a variety of publicity stills and production shots from the film, all of which are accompanied by the movie’s score. None of these were terribly stimulating, but it’s an acceptable addition to the package. Unfortunately, the Blu-ray drops a mix of extras from the DVD. Most are inconsequential, but the absence of Death Takes a Holiday - the film on which Meet was based – becomes a major disappointment. Meet Joe Black has a variety of flaws, most of which relate to its excessive length, but I nonetheless think that it remains strangely watchable and compelling. I can’t call it a great flick, but it works for me. The Blu-ray provides decent audio, erratic visuals and minor bonus features. I like the movie but find the Blu-ray to provide a less than stellar representation of it.